Jeovani has made a career out of helping others achieve their dreams, which is what makes him the professional he is today. “When the housing market crashed, my family and I experienced the hardships following the collapse of our economy. Although I was young at the time, I could understand the struggle my parents endured losing the home they worked so hard for. I made a promise to educate myself to be able to make a difference for them, and for others”. Jeovani attended the University of Utah Business School of Finance. He then became a loan officer to have an understanding of the mortgage loan process. He was licensed in 7 different states before deciding to make his mark in real estate. Since then he has been a huge asset to many friends, family, and new clients in making educated decisions when buying, selling or investing in real estate. 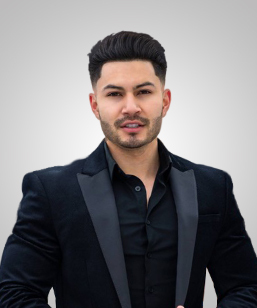 His dedication to service is also demonstrated in his involvement with the National Association of Hispanic Real Estate Professionals where he is a Membership Director. He is very involved within the community and helping others make the best-educated decision when making one of the biggest investments in their lifetime. His passion to provide exceptional service makes him an obvious choice for any and all of your real estate needs.